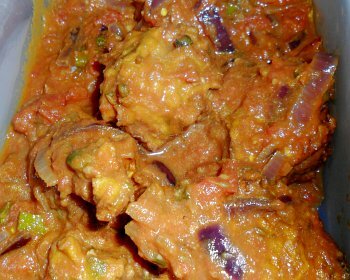 Lauki is the base for this delicious Kofta. In a large pan add the olive oil and the jeera and heat until the jeera starts to pop, releasing the spice into the oil. 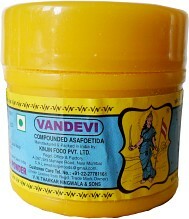 Add the asafoetida and let it dissolve - note that it is usually cut with rice flour which will not dissolve so don't wait more than 30 seconds or so. Add the coriander powder and then the turmeric, letting the yellow colour of the turmeric spread throughout the oil. Chop the chillies and onions and add them, along with the garlic and ginger. Fry them for a minute or so and then add 50-100mls water, stir it around and put the lid on. Cook until the onion is soft. Add the chopped tomatoes and salt, along with the lemon juice and creamed coconut and bring to the boil, stirring all of the time. Put on the lid and turn it off. Top and tail, skin and then shred the Lauki, using a large grater. Squeeze out any excess moisture and place it in a medium-sized plastic bowl. Slice up the onions and chillies finely and put them in the bowl. Wash and then slice finely the fresh coriander leaf and put that in the bowl. Mix them up so that they are evenly distributed. 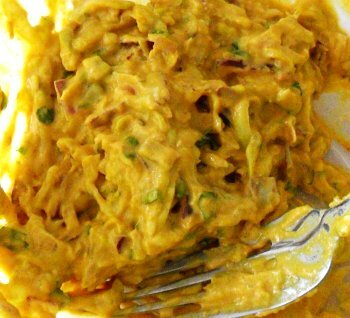 To the bowl, add the Besan, turmeric powder and coriander powder, mixing it in so that it is evenly distributed. 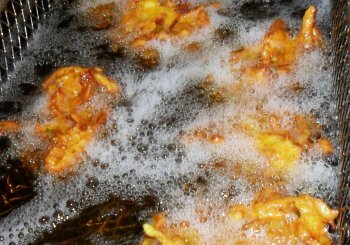 Add the lemon juice and then some water so that you end up with a batter of a similar consistency to the onion bhaji batter. If the batter is too stiff, add some more water, if too loose, add some more besan. Using a fork, make small, golf-ball-sized pieces of bhaji/kofta and drop them into the oil. Fry them until they turn golden brown. If the oil was hotter, the insides would not be cooked properly so it is better to use this lower temperature. You will have to do this in several batches - my fryer took batches of 8 at a time. When they are ready, drain them and put them on some kitchen towel. Finished Lauki Kofta in its sauce. You can have a bed of rice for this dish as well. Add the fried kofta/bhajis to the sauce, making sure you cover them completely with the sauce. Divide up equally into three lunch boxes.